helps to promote proper body alignment, leading to increased grace and poise. ■ foot toward the left so that it is pointing directly in front of your left hip and forms a 90-degree angle to your body. Slide your right foot so that it is angled in toward your body at about a 30- to 45-degree angle. Your body is now facing toward the left and the heel of your right foot is directly in line with the center of your left foot. Inhale and shift your hips toward your left. As you exhale, shift your upper body toward the left. Lead with the fingers of the left hand as you pull yourself as far to the left as possible. Your arms are still parallel to the ground. When you've reached your maximum stretch to the left, lower your left hand to touch the left leg wherever it easily reaches—thigh, knee, shin, ankle, or foot. If you are extremely flexible, you may even be able touch the floor with your left fingertips or even the palm of your hand. 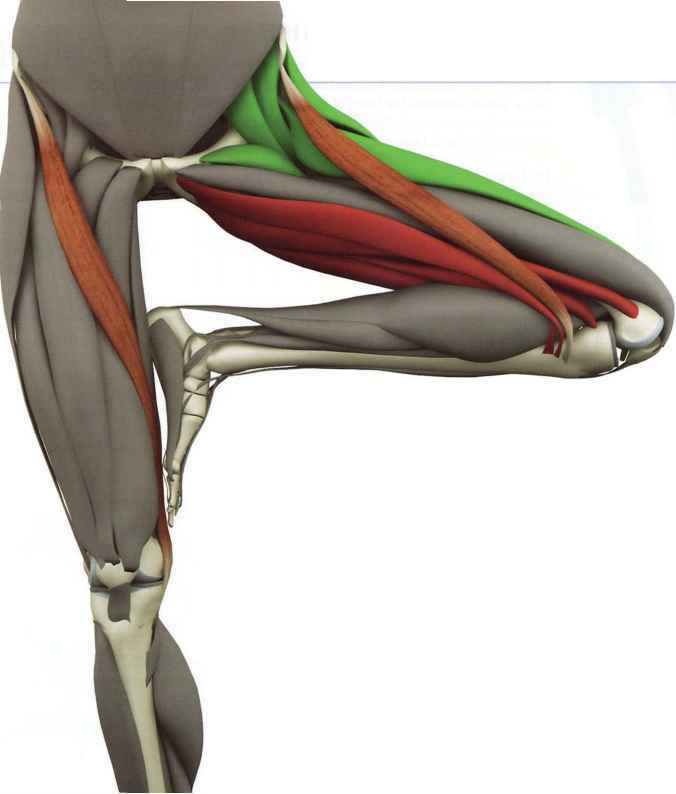 Keep both legs straight, knees gentle, but not bent. Rotate the right shoulder up toward the ceiling as you lift your right arm and hand straight up. Feel as though the movement is being initiated from the fingers of the raised right hand, as though they are being pulled toward the ceiling. Maintain as straight a position as pos-sible—in the ideal posture, both your arms would form a single unbroken straight line perpendicular to the floor. Your torso would be perfectly parallel to both the floor and the wall in back or in front of you. This is the ideal. Accept where you and your body are today as you hold yourself in Triangle Pose for several breaths. When you are ready to release from Triangle Pose, raise up your left arm on an exhalation while simultaneously lowering the right arm. Allow both arms to float down to your sides. Walk your feet back together again and rest for a few breaths in Mountain Pose. Take this time to breathe, relax, and center. Take stock of how you feel. Then prepare to perform Triangle Pose on the opposite side of your body. If you have difficulty maintaining balance in the pose, try placing the palm of your hand on a support such as a wood or foam block. Fig. 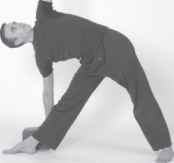 YPS.4b shows Triangle Pose toward the right side of the body with support from a yoga block.